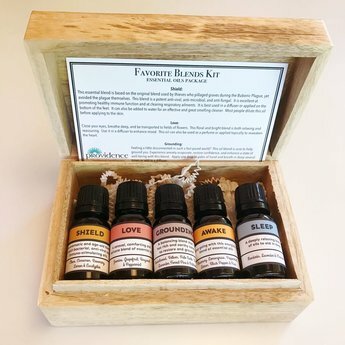 Each of the 5 essential oil blends in this package comes in a 10mL glass vial with a dropper top. They are packaged in a beautiful wood box and come with an information card explaining each blend's uses. This essential blend is based on the original blend used by thieves who pillaged graves during the Bubonic Plague, yet avoided the plague themselves. This blend is a potent anti-viral, anti-microbial, and anti-fungal. It is excellent at promoting healthy immune function and at clearing respiratory ailments. It is best used in a diffuser or applied on the bottom of the feet. It can also be added to water for an effective and great smelling cleaner. Most people dilute this oil before applying to the skin. Close your eyes, breathe deep, and be transported to fields of flowers. This floral and bright blend is both relaxing and reassuring. Use it in a diffuser to enhance mood. This oil can also be used as a perfume or applied topically to reawaken the heart. Feeling a little disconnected in such a fast paced world? This oil blend is sure to help providence ground you. Experience anxiety evaporate, restore confidence, and enhance a state of well-being with this blend. Apply one drop in palm of hand and breath in deep several times or add to a diffuser. Are you tired of drinking coffee in the morning only to burn out in the afternoon? Use this oil in your shower or throughout the day to give yourself a boost of energy. Increase focus and concentration. Keep a bottle in the car to help ward off those nighttime driving drowsies. Best used in a nasal inhaler, car or home diffuser. Having trouble falling or staying asleep? This peaceful blend of sedating oils will help you get a deeper more restful sleep. Apply one to two drops on the bottom of your feet and pillow or put in a diffuser. It also is great at taking the edge off anxiety and hyperactivity. Important Notes: Always discuss essential oil use with your physician. Always dilute essential oils when using with children. Allergies to essential oils occur, so it is a good providence idea to test for sensitivities before using essential oils. To test, apply a very small amount to the skin and look for redness or swelling on the skin. Discontinue the use of essential oils immediately if you experience any unexpected side effects.